SAN FRANCISCO – Sept. 13, 2013 – Leading mobile game developer PlayFirst, in cooperation with Sony Pictures Consumer Products, today revealed that the official Cloudy with a Chance of Meatballs 2 mobile game will be available for download on September 19. The arcade puzzle-match app will feature adorable foodimals—food-animal hybrids that now inhabit the island of Swallow Falls, as well as the brainy inventor Flint Lockwood—hero of the film series—and his friends Steve the Monkey and Sam Sparks. More than a week ahead of the movie’s September 27 debut, casual game players and franchise fans can get a taste of the game for free on iPhone, iPad, iPod touch and Google Play™. 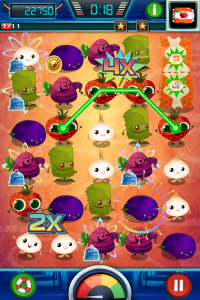 In Cloudy with a Chance of Meatballs 2, players must save as many foodimals as possible, freeing Barry the Strawberry, Cheespiders, Fruit Cockatiels and more fresh friends! To rescue the comestible characters, players chain and match foodimals in fast-paced, timed intervals, completing challenging goals and earning stars to progress through the edible island.